Are you a fan of board games? The designers of the Nanoleaf Remote are probably fans of board games. 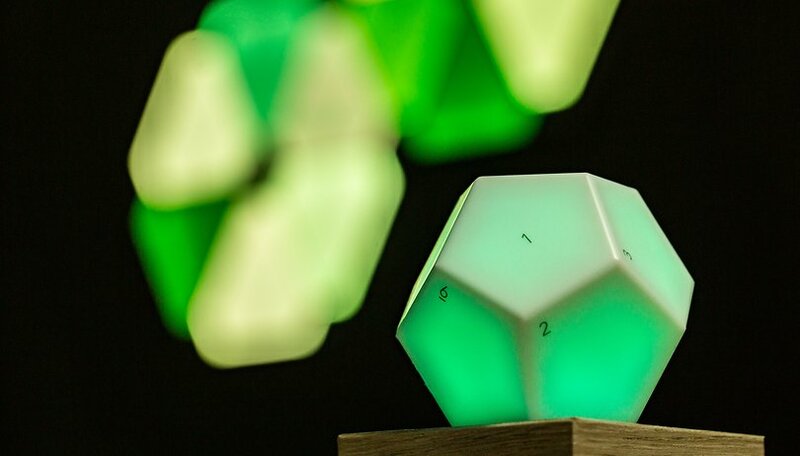 The original remote control for the Nanoleaf light has the shape of a 12-sided die that’s a bit overgrown (each face is a numbered pentagon). It’s not too bulky, however, and has a total length of about 10cm, to give you an idea about the scale, making it convenient and practical to use. The remote control comes in a casing of two different pieces of plastic. At first touch it felt as though low-quality materials were used, but after a while I got the sense that the plastic was durable and resistant to scratches. One half of the remote control has no hardware inside it at all, but everything it needs to function is in there somewhere. Before you start assembling the whole thing, you’ll need to insert to batteries to get started with the device. If you forget to do this, it will be challenging to separate the two halves of the device, even though there’s a crack that’s meant to help you split them. The manufacturer claims that you’ll get three years of stand-by use from two single AA batteries and one year of continuous use. Okay, it’s a big 12-sided die with batteries inserted into it. How is that supposed to help you control your Nanoleaf lights? There’s an interesting idea at play behind this remote control, and it’s as simple as it is ingenious. Each face of the die corresponds to some setting for the Nanoleaf lights. Face number 1 corresponds to “lights on” and face number 12 corresponds to “lights off”. Of course, you can manually configure each face of the die as you like, including the numbers 1 and 12. For the sake of convenience, I continued using the basic configuration. And without much configuration, you can simply rotate the die to control the lights remotely. And that’s not all. By rotating the die and keeping the bottom face on the table (as if you were turning a glass full of water), you can adjust the light intensity. This type of gesture, which is implemented thanks to a gyroscope inside the remote control, is convenient, intuitive and genius. It feels as though you’re controlling your Aurora with your mind. Each time the scene changes, the die responds with a pleasant vibration to confirm the change. You’ll notice the recognition when you change the light intensity with a vibration that accompanies the entire rotation of the die. Learning how to operate the Nanoleaf Remote takes just a couple of minutes, unlike pairing it with the lights and the smartphone app, at least from my personal experience. I tried unsuccessfully to connect the remote to my P20 Pro, and my smartphone didn’t want to recognize the accessory. For convenience and speed I switched to an iPhone X that was already in my other pocket (I’m not sure if I would have reached the same results with another device). Once the accessory is recognized by scanning a QR code, you can immediately customize the various faces of the app. In the Remote section of the Nanoleaf app (the same one used to configure the lights), you’ll find a list of all 12 faces. You can customize each of them by tapping on them, which is quite easy. There’s also an interesting button that will let you illuminate the remote control via the app in case you don’t remember where you left it. There’s no extra app required for controlling the Nanoleaf Remote, which is a good thing. However, the hardware will impose some limitations. You can adjust the brightness of the lights without Nanoleaf Rhythm, another accessory designed to have the light “listen” to the music and react accordingly. This small and interesting gadget costs exactly the same as the remote control: $49.99. If you don’t have rhythm you’ll have to spend 100 bucks to have fun controlling your lights without a smartphone, which I personally find a bit too expensive. Compared to the price of the Nanoleaf Aurora (currently around $60) the cost is almost double the lights themselves. Is anyone really willing to spend that amount on a gadget (as interesting as it is) that is quite superfluous?